Lift; Hall / kitchen / living room / bedroom / bath with shower / WC / + guest toilet; 1-4 pers. PLEASE ASK FOR PRICED RATES FROM 7 NIGHTS! 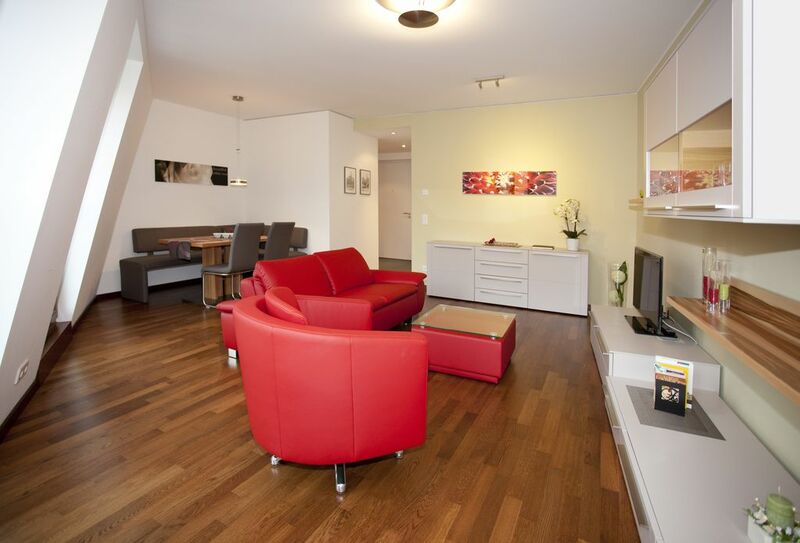 The apartment is centrally located in a traffic-calmed zone in the middle of the historic city of Dresden. It is located in the 'Palais am Neumarkt', a building newly built in 2011. The world-famous Frauenkirche am Neumarkt is only 150 m away. The apartment will be the starting point for your "discoveries" - all important sights of the old town such as Frauenkirche, castle, cathedral (Hofkirche), Zwinger, Semperoper etc. are in the immediate vicinity and are within easy walking distance. A total of 6 French windows (living room, bedroom) allow a direct view of the listed facade of the Albertinum (Staatliche Kunstsammlungen Dresden). Special features are: high-quality wooden parquet or Italian tiles with underfloor heating; large living room with sofa bed, armchair and separate dining area; Bedroom with small loggia, double bed and 5-door wardrobe; generous bath; separate guest toilet. The apartment is in a unique central location on the top floor of a residential and commercial building and is easily accessible via a lift. The apartment is barrier-free - therefore senior-friendly. Enjoy the exclusive and very high quality furnishings in a modern ambience. In the establishment value was placed on a hypoallergenic equipment. Tile or Parquet flooring, underfloor heating and allergy-friendly mattresses + bed linen take this requirement into account. With approximately 60 m2 of living space, the apartment is the ideal size for singles, couples and small families. There is a double bed (190 x 160 cm) available as well as an extra bed a sofa bed (200 x 140 cm). You can park your car comfortably in the paid underground car park in front of the house or at a reasonable price on a car park about 100 meters away (6, - EUR / day). Public transport can be reached within 3 minutes on foot. For bicycles a storage room is available. To give you the greatest possible independence, you will receive two keys for the apartment. You can fully self-cater, as well as take advantage of the nearby culinary diversity. For example, several bakers / restaurants within a radius of about 200 meters daily offer a complete breakfast buffet. Many restaurants, cafes and bars are in the immediate vicinity. There is a free Wi-Fi access. incl. Additional costs (electricity, water, heating, WLAN) Incl. Bed linen, towels, tea towels. Incl. Detergents, Spülitabs, trash bags, kitchen towels, toilet paper, etc. Wir empfehlen Sie gerne weiter - sehr hochwertige Wohnung mitten in Dresden, nette Vermieter - Dankeschön! One of the best rentals ever! We have rented via VRBO in Prague, France, Ireland, Italy, Japan, and the Netherlands -- but this apartment is in a class of itself: location, just a short block from the Frauenkirche; quality of the building, kitchen, kitchen equipment, bathroom, (floor) heating; cleanliness; and especially the owner, who picked us up from the train station and also brought us back there when we left for Prague -- really a super service for a not-so-young couple. We cannot recommend this apartment strongly enough. Die besten Gastgeber, die wir je hatten ! Sowohl von der Lage als auch von der Ausstattung und der Betreuung her ein Spitzendomizil . Die Wohnung liegt nur wenige Schritte von Neumarkt und Frauenkirche entfernt. Aus dem Wohnzimmer heraus guckt man direkt auf das Albertinum. Dort die Treppen rauf, schon schaut man auf die Elbe. Brötchen gibt's in etwa 100m Entfernung, ein Lidl befindet sich etwa 400 m entfernt. Die Wohnung ist sauber und hochwertig ausgestattet, man findet alles vor (von Kaffeefilter über Spültabs bis zum Toilettenpapier). Die Betten sind fertig bezogen, ausreichend Handtücher sind vorhanden. Urlaub von der 1. Minute an. In der Wohnung liegen jede Menge Bröschüren und Ausflugstipps für Dresden und Umgebung soviel Bildbände über die Geschichte Dresdens. Netter Kontakt zum Vermieter, er war bei An-/Abreise persönlich vor Ort. Nochmals liebe Grüße nach Dresden. This is a new and elegent apartment. Its furnishings are modern, up-scale, comfortable, and also like-new. I belive the building was erected and the apartment furnished in 2011. It offers almost all the conveniences one would want for top-end living: an elevator, a fully equipped modern kitchen, comfortable beds, a flat-screen TV, and Wi-Fi. The apartment was well-maintained and spotlessly clean. The location is central to Dresden--an easy 10-15 minute walk to Frauenkirche or the other major sites in the altstadt. We walked to the Semperopera in 12 minutes. (But I can not recommend its wierd production of Manon Lescaut). The building and the area are quiet: the street has very little traffic and we never heard the neighbors. Near-by parking in a public lot is inexpensive at Euro 6 per day. There are two shortcomings: there is no clothes washer/dryer set-up and the apartment lacks a fan or portable AC. These latter would have been helpful when we were there since for three/four days the temperatures reached about 95 degrees centigrade. Supplying this additional equipment would be a good improvement. We highly recommend this apartment, and we would rent it again if we were to return to Dresden. many thanks for your kind valuation. A fan will be available soon. A laundry service you can use at a hotel next door. In the apartment you will find a laundry bag and a price list for this service. exclusive apartment in absolute top location in the middle of the historic old town of Dresden, between the Kurländer Palais and the Coselpalais, directly opposite the Albertinum. All tourist highlights and museums are within walking distance. The world-famous Frauenkirche on Neumarkt is only 150 m away. Für Langzeitmieter können separate Konditionen vereinbart werden. Der Mietpreis gilt bei einer Belegung von 1 - 2 Personen. Pro zusätzlichem Gast werden 20,-- EUR pro Nacht für Aufbettung, Bettwäsche + Handtücher berechnet. Zuzügl. Beherbergungssteuer gemäß Steuersatzung der Stadt Dresden Maximalbelegung: 4 Personen Ostern, Pfingsten, Adventszeit/ Weihnachten sowie Silvester/ Neujahr haben wir eine Mindestbuchungsdauer von 4 Nächten.